​ Hungary in 1956. A Soviet invasion to stifle a growing movement for independence. The moment can be viewed in many ways as the precursor to The Unbearable Lightness of Being’s Czechoslovakia, and the book shares themes with the Kundera novel: love and betrayal in times of political upheaval. Wars don’t just end — they leave bodies and ghosts. The collision of 1956 had its roots in the Second World War, where Hungary fought on the side of the Axis and experienced great hardship in defeat. 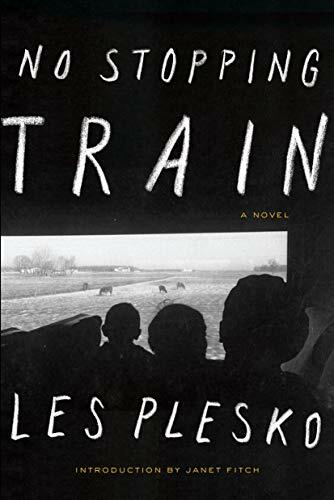 In the division of Europe, Hungary fell on the Soviet side, so scores were being settled as people tried to survive, a situation Plesko brilliantly illuminates in his novel. No Stopping Train starts with the War and its aftermath; the girl Margit and her embittered mother; her love affair and eventual marriage to the document forger Sandor; and their involvement with the fearsome, magnetic redheaded Erzhebet, whom he’d once saved from the camps. In the years leading to the Hungarian Revolution, love and alliances shift repeatedly, as each character struggles with his or her own level of hope and despair. Janet Fitch is the author of the novels Paint It Black and White Oleander. Her short stories and essays have appeared in anthologies and journals such as Black Clock, Room of One's Own, and Los Angeles Noir, and she is a contributing editor at the Los Angeles Review of Books. A film version of her novel Paint It Black will be going into production later this year. She is currently finishing a novel set during the Russian Revolution. Fitch regularly blogs at www.janetfitchwrites.wordpress.com. Wow, what a story! Who is writing all of that into a book because, man, that is something I would love to read! It is always sad when beautiful minds decide they can’t handle any more on earth. And especially more so when we come to admire and revere their work after their death. Thank you so much for sharing this beautiful story. Thank you to The Millions and to you Janet Fitch for introducing me to an author I had never heard of. Another saga to fit into that Venn diagram with its ever shrinking overlap. Also looking forward to the film of Paint It Black, a book I loved unconditionally, and to your new novel. Maybe I will reread Paint It Black while I wait. Thank you, Janet! I just got a copy of the book, was so delighted to see it on the shelves in the Barnes and Noble out in the outskirts where I live. From the first page I was struck with nostalgia for the beauty of his writing and what he stood for. It is all over the page. I took class from Les not long ago. When he started off with a very long bibliography of novels and philosophical writings, and sent us youtube links he loved — notably, videos of Slavoj Zizek and readings from Gregory Corso and Kate Braverman — I thought, here is someone I can learn something from. With the recent publication of No STopping Train I looked back through emails exchanged, sadly, wishing Les back, I recognized what a great gift he had given. He actually took the time to talk about writing. From one of his thousand students, thank you for helping this book come to fruition and get the recognition it deserves. Thank you for this lovely tribute. I was in Les’ Saturday workshop which he began after Kate left for New York State. Kate was, as you know, a tough and inspiring mentor for some of us in the 90s. Les’ was no less inspiring, and served me well in encouraging me to find a voice that wasn’t Kate’s and wasn’t his. Anyone who has diligently read my Millions posts over the years (and I know you’re out there, somewhere) will know that I’m drawn to stories written by or about immigrants, whether it’s Mavis Gallant as the ex-pat Canadian writer in Paris writing about European post-war dislocation, Goran Simic writing in his adopted home of Canada about Sarajevo in the 90s, Rawi Hage, also in his adopted country Canada writing about the streets of Beirut in the 80s, or Michael Ondaatje returning to his Sri Lankan roots to write about the generations that came before him.So I’m more than a little embarrassed to confess that until about five minutes ago, I hadn’t realized that the three readings I attended a few weeks ago at the Toronto International Authors Festival could also be linked by this same theme. I’ve already written about Sarah Vowell on the Puritan immigrants to the Massachusetts Bay colony in the 1630s, and then Junot Díaz, together with Rawi Hage, speaking of the experience of being immigrant authors writing about immigrant families in modern cosmopolitan North America.The third reading I attended was by Amitav Ghosh, the Calcutta-born writer who, in a little over fifty years has also lived in Sri Lanka, Delhi, Goa, Egypt, Britain, and the United States, where he lives part of the year with his American wife. A multiple emigre with an admitted sense of dislocation, he’s the first in fourteen generations to marry outside his Bengali home district. He has spent a lifetime writing about dislocation and displacement, with their resultant sense of loss, but also with their capacity for opportunity.Ghosh spoke with CBC Radio’s Eleanor Wachtel for well over an hour on his extraordinary life and on his latest novel, Sea of Poppies. The interview was recorded and edited down to 45 minutes for Wachtel’s Writers & Co. radio show. A few quotes and observations:On the Maoist insurgency in Calcutta during his boyhood, on the upheaval around him: it was “formative to see places that are convulsed.” On the anti-Hindu riots of 1964, as hundreds of Hindus took refuge at the Ghosh family compound, Ghosh says that “because there were so many people, you don’t feel that palpable threat.”From age nine to eleven, he lived in Sri Lanka; with its beaches it proved to be “a kind of wonderland” for young Amitav. But even as a child, he sensed that “normal is never normal,” and with the ethnic strife he was aware of “tectonic plates shifting underneath.” This led to an interesting sidebar on the false assumption of security that many people have. When something horrific like 9/11 happens, Ghosh continues, those with that mindset tend to swing to overreaction.College in Delhi was “intellectually stimulating,” more so than the time he would later spend learning and teaching at Oxford and Harvard. Ghosh went on to live in Egypt in the 1980s which led to a discussion on India’s forgotten relationships: with Egypt, with China. India attempted and failed at one time to rebuild bridges between cultures whose relationships were interrupted by colonialism.On his beloved Indian ocean, Ghosh affirmed his affection for the “multiplicity of it.” Every part of it is different – Calcutta from Madras from Burma from Mauritius. On the repression in Burma, Ghosh believes that “politics is not capable of devouring the entirety of life,” so even in an oppressive Burma, friendships, and a life outside of the political reality, can form and flourish.His latest novel, Sea Of Poppies, is the first part of a proposed trilogy, and deals with indentured migrant workers in the 1830s, replacing African slaves after the abolition of the slave trade. They were poppy growers during the Opium Wars. Ghosh spoke of the roots of the wars: China, due to mass-addiction, bans the importation of opium; consequently Britain goes to war to reinstate the “free-trade” of opium. This led to Ghosh musing rhetorically: “How is it free if governments wage a war to enhance the trade?”Ghosh commented that portions of the novel – bits of dialogue – are written in a kind of pidgin English. He comments that “as writers, language is the equivalent of a mise-en-scene.” It serves many purposes, one of them being as “white noise,” rather than to communicate information. Consequently, there’s no need to understand every word, no need to decode the pidgin English.And Ghosh also commented that there are few narratives of departure among immigrant writers. Most tend to write about the life of arrival, rather than the life of leaving.